The pineapple is a member of the tropical bromeliad family. It is believed that the pineapple originated in the fertile soil of Paraguay. These fruits were transported by Christopher Columbus who brought them home from his travels in the “New World” and they soon became a gourmet delight savoured across Europe. Pineapples are actually not just one fruit but a composite of many flowers whose individual “fruitlets” fuse together around a central core. Each fruitlet can be identified by an “eye,” which is the rough spiny marking on the pineapple’s surface. Pineapples have a wide cylindrical shape, a scaly green, brown or yellow skin and a regal crown of spiny, blue-green leaves. 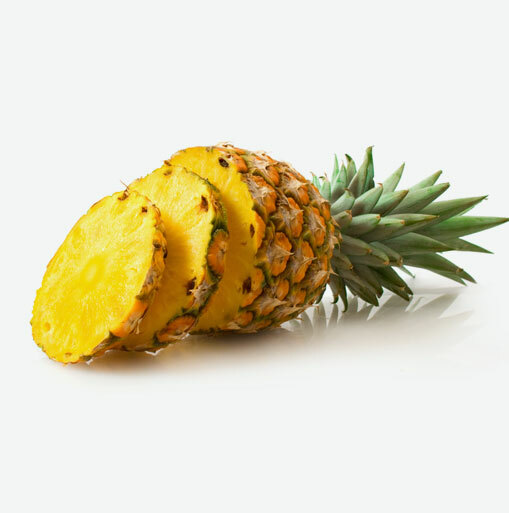 The fibrous flesh of pineapple is yellow in colour and has a delicious tropical flavour. Fresh pineapple is rich in bromelain, an enzyme that not only aids digestion, but can effectively reduce inflammation and swelling, and has even been used experimentally as an anti-cancer agent. A variety of inflammatory agents are inhibited by the action of bromelain. In clinical human trials, bromelain has demonstrated signifcant anti-inflammatory effects, reducing swelling in inflammatory conditions such as acute sinusitis, sore throat, arthritis and gout, and speeding recovery from injuries and surgery. To maximize bromelain’s anti-inflammatory effects, pineapple should be eaten alone between meals or its enzymes will be used up digesting food. Bromelain is found in both the flesh and stem of pineapple. Since it is deactivated by heat, pineapple juice and canned pineapple are not good sources of this health-promoting enzyme. In terms of getting bromelain from pineapple, fresh is definitely the way to go. When choosing your pineapple, select one that is plump and fresh looking. Fresh, green leaves in the crown are a good sign. The body should be firm and not soft. The larger the pineapple, the greater proportion of edible fruit but that doesn’t mean that it is better tasting or any riper than smaller fruit. The colour of the skin or shell is not necessarily a sign of maturity or ripeness. A pineapple can be ripe when it is practically all green outside. A pineapple will not ripen any further or become sweeter after it is harvested. Sugar is what makes pineapple sweet after they have ripened. The sugar comes from the conversion of starch reserves in the stump at the time of ripening. Don’t be fooled though! Ease in pulling the leaves out of the crown is not a sign of ripeness or good quality. Pineapple that has been cut up should be stored in the refrigerator in an airtight container. It will stay fresher and retain more taste and juiciness if you also place some liquid, preferably some juice from the pineapple, in the container. Regardless of how you cut pineapples, the first step is always to remove the crown and the base of the fruit with a knife. To peel the pineapple, place it base side down and carefully slice off the skin, carving out any remaining “eyes” with the tip of your knife. You can cut the pineapple into quarters by removing the core if desired. Make slices into the quarters cutting from the flesh towards the rind, and then use your knife to separate the fruit from the rind. Once the rind is removed, cut the pineapple into the desired shape and size.